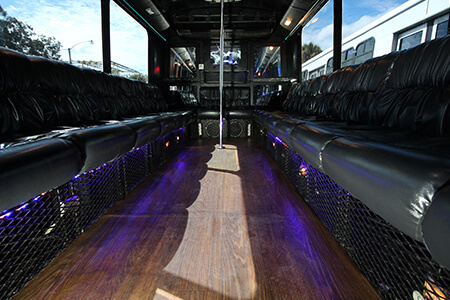 If you're looking for the best party buses in Tampa, you've come to the right place. 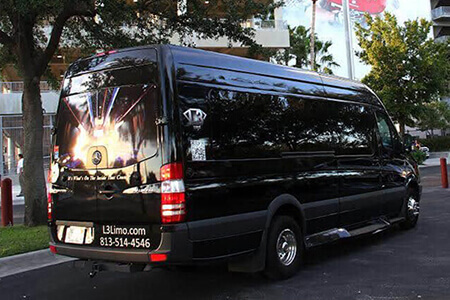 Below you'll find some photos of our beautiful vehicles from our 15 passenger Mercedes limo bus to our largest party bus right down to our luxury shuttle vehicles! You'll find that all of our vehicles have beautiful interior designs, and amazing entertainment features like colorful lighting, TVs, and coolers! You'll find that our fleet is versatile enough to provide the best transportation for any type of event! Our agents are available 24 hours per day to give you pricing on any of these amazing vehicles! If you'd like to view any of these vehicles in person or if you're interested in renting a particular one, just give us a call! 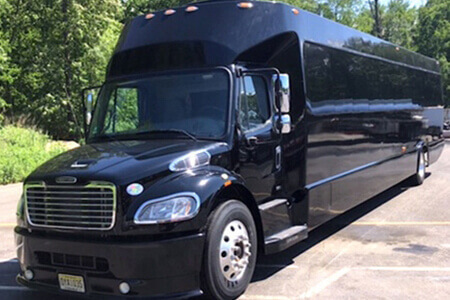 We offer two versions of our Mercedes Sprinter Van limousine bus - one version with forward-facing seats and the other with limo-style seating (pictured). If you're celebrating a fun Tampa event, this is ag reat choice! This luxurious vehicle seats up to 15 passengers in the lap of luxury! Tinted windows, privacy shades, colorful lights, and bar are just the beginning! 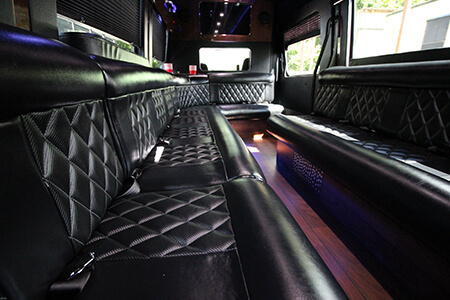 Our up to 20 passenger party bus is a great choice for any occasion from weddings to birthdays. 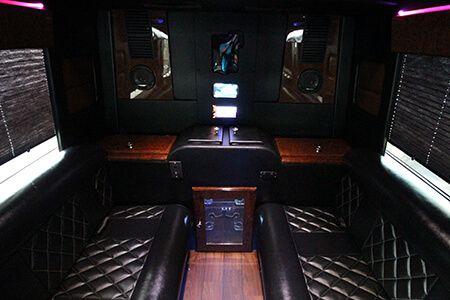 This limo bus features limo-style seating, two flat screen TVs, a great stereo systems, players for DVD and aux connection for your iPod or phone, two bar areas and gorgeous wood floors! 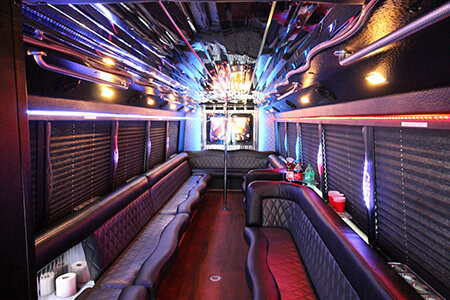 Our 22 passenger party bus is a luxury choice for small-medium sized groups out for a night of fun! 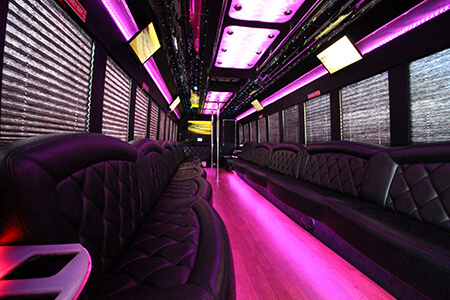 Fun, yet elegant, this Tampa party bus is ready for anything. 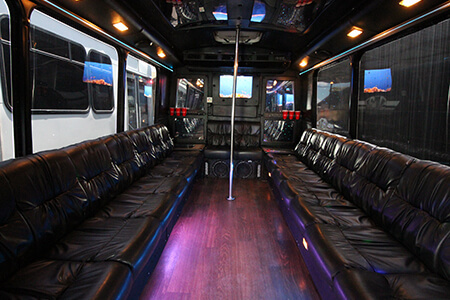 Custom limo style seats, dance pole, club-syle lights, a 50" flat screen TV, bar area, 3000 watt stereo system, bar area and optional hostess are all featured! This is a gorgeous bus and is perfect for any event! 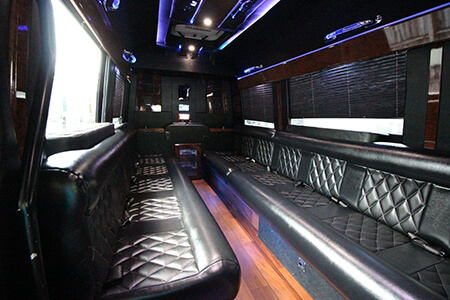 Medium sized groups will love our 32 passenger party bus. If you're celebrating a birthday, getting married, or anything else in Tampa, this is a perfect choice! 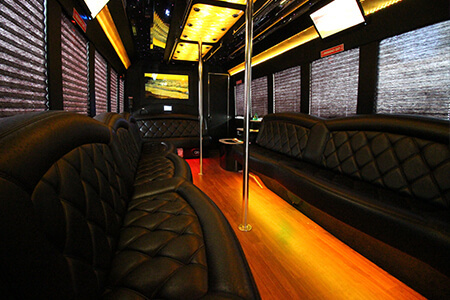 This luxurious bus has beautiful wood floors, custom leather limo-style seats, dance pole, bar area, huge 50" flat screen TV, DVD/BluRay player, 3000 watt stereo system, optional hostess, and colorful club lighting! 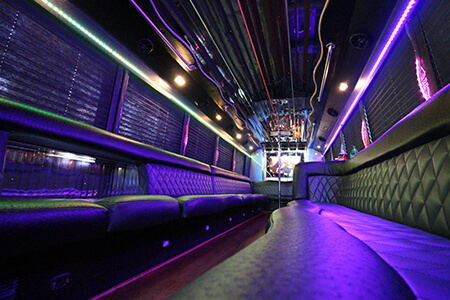 Our big party bus is truly a nightclub on wheels! 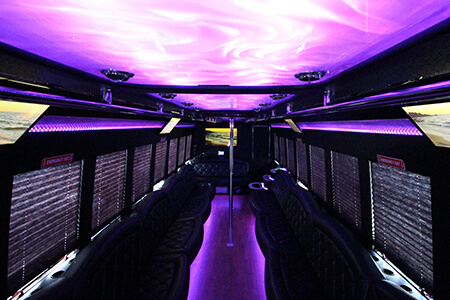 This bus seats up to 42 passengers in the lap of luxury with custom leather seats and features wood floors, dance pole, club-style color changing lights, custom ceiling lighting, 50" flat screen TV with DVD/BluRay player, 3000 watt stereo system, bar area and optional hostess! 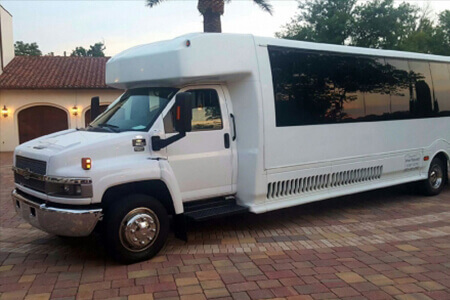 This is the perfect bus for large groups looking to party! Top left to right: Avalon Hybrid, Cadillac Escalade ESV. Bottom left to right: Chrysler 300, Lincoln Towncar. Our luxury shuttle vehicles are perfect for anyone looking for transportation to and from the airport, a day of shopping, or anything you wish! 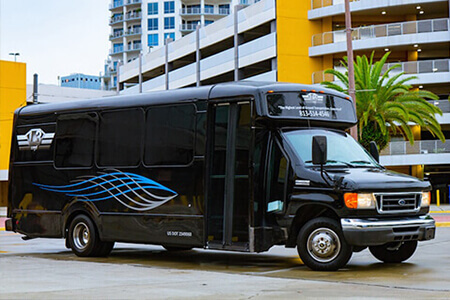 Our shuttle fleet is great for anyone looking for comfortable, relaxing, and luxurious travel! Give us a call to reserve!